The leading U.S. presidential hopefuls reacted strongly Monday to the massacre at a gay nightclub in Orlando, Florida. 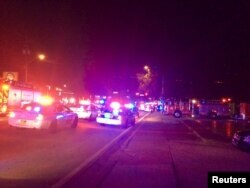 Sunday's incident that left 49 people dead and 53 others wounded was the worst mass shooting in U.S. history. The gunman, Omar Mateen, was a U.S. citizen and the son of Afghan parents. In her first speech since the shooting, presumptive Democratic presidential nominee Hillary Clinton told supporters in Cleveland, "The Orlando terrorist may be dead, but the virus that poisoned his mind remains very much alive." Clinton laid out a multi-faceted approach to combating terrorism. The plan would disrupt terrorist groups by infiltrating their online networks, enhancing intelligence sharing among local and federal law enforcement agencies, and asking allied nations to help "prevent the radicalization and recruitment" of potential terrorists in the U.S. and Europe. In an apparent response to presumptive Republican Party opponent Donald Trump's charge that President Barack Obama and other Democrats refuse to use the word "radical" to describe terrorists who happen to be Muslim, Clinton said earlier on CNN that she is not afraid to use the term, but says she refuses "to demonize and demagogue and declare war on an entire religion." Doing so, she said, "plays right into the ISIS' hands." ISIS is an acronym for Islamic State, which is also known as IS, ISIL and Daesh. Police cars and fire trucks are seen outside the Pulse night club where police said a suspected gunman left multiple people dead and injured in Orlando, Florida, June 12, 2016. Clinton called for citizens to reach out to Muslims in the United States "to help us defeat this threat." She cited the need for "common sense reform" of gun ownership laws, including a ban on assault weapons. After Obama did not use the term "radical" in his remarks Sunday from the White House, Trump criticized Obama's approach to extremism and said the president "should step down." Trump, meanwhile, renewed a call for a ban on the entry of Muslim immigrants into the United States. "The only reason the killer was in America in the first place was we allowed his family to come here," Trump said in a speech to supporters in Manchester, New Hampshire. Trump said he would lift the ban when the government develops the ability to screen people "perfectly." Trump said the U.S. has a "dysfunctional immigration system" and a "dysfunctional administration." Trump said if he is elected president, things are "going to change" and "going to change quickly." Trump said he wants "a mainstream immigration policy" that reflects American values, and more cooperation between local, state and overseas intelligence operations. Obama Calls Orlando Attack "Homegrown Extremism"
Earlier Monday on CNN, Trump said Muslims have to report suspicious people, and reiterated his support for strong gun ownership laws. "Gun owners more than ever need to protect themselves. If people in that [nightclub] had guns, you would not have had the same tragedy," he said. On Capitol Hill on Monday, Senate Majority Leader Mitch McConnell said, "ISIL claims the terrorist who committed this horrific act is one of the soldiers of the caliphate. I'll call him what he really is — a coward, a murderer who claimed allegiance to a brutal group that crucifies children and beheads women. This terrorist sought to spread fear and sadness and suffering. “Yet, even amidst the horror, he couldn't destroy our common bonds of humanity," he added. "It's no longer an open question whether the followers of ISIL and other Islamic terrorist groups will attempt to strike us here in the West. They have. And they are going to continue to do so. We need to do what we can to fight back so we can prevent more of these atrocities." Senate Minority Leader Harry Reid called the shooting "an attack on the LGBT community and all America." "I am heartsick, I am basically sick by our inaction. It's shameful that the United States Senate has done nothing, nothing to stop these mass shootings," he said. “As of today, FBI terror suspects can walk into a gun store and legally purchase assault weapons and explosives. Senate Republicans have voted against expanded background checks, limits on the size of ammunition clips and the assault weapons ban. Everyone in this chamber should be able to agree that suspected terrorists shouldn't have guns. Republicans need to find the backbone to stand up to groups like the NRA. It's time for Congress to do something to stop the mass slaughter that's being carried out in our communities." U.S. Secretary of State John Kerry responded to the mass shooting after meeting Monday in Washington with Cypriot Prime Minister Ionnis Kasoulides. "It is horrific in every, every sense of the meaning of that word and I think an act that is profoundly filled with hate as well as a desire to sow terror in people," he said. "All of us will continue in every way possible here at the State Department, where we are deeply engaged every single day in this fight against ISIL." Kasoulides called the massacre a "heinous terrorist attack of hate" and expressed his country's "solidarity in the fight against terrorists worldwide." Former Afghan president Hamid Karzai told VOA's Afghan service, "I fully understand the pain of the American people in this hour. We in Afghanistan have suffered for a long time and daily from such shootings and killings." In Kabul, Afghan President Mohammad Ashraf Ghani strongly condemned the attack. "Targeting civilians is not justifiable under any circumstances whatsoever," he said. The Vatican issued a statement on behalf of the pope. "Pope Francis joins the families of the victims and all of the injured in prayer and in compassion. Sharing in their indescribable suffering, he entrusts them to the Lord so they may find comfort." The president of the World Jewish Congress, Ronald Lauder, condemned the massacre, describing it as a hate crime that targeted a minority. "Any act of hate against any group, particularly a minority group, we the Jewish people stand in solidarity against this." Lauder added, "I believe there is a great deal of linkage behind what happens here in Israel and what happened in Orlando because, again, it's about hate." German Chancellor Angela Merkel, speaking Monday in China said, "We have a heavy heart" over the fact that "the hatred and malignancy of a single person" cost people their lives. 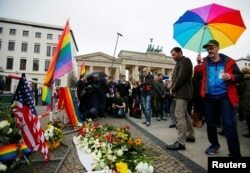 Vigil for victims of Pulse Orlando shooting in front of the U.S. Embassy and Brandenburg gate, Berlin, Germany, June 13, 2016. Britain's Queen Elizabeth sent a message to Obama. "Prince Philip and I have been shocked by the events in Orlando. Our thoughts and prayers are with all those who have been affected," the message said. A statement from the French president's office said Francois Hollande "condemns with horror" the mass killing in Florida, and "expresses the full support of France ... with America's authorities and its people in this difficult time." Palestinian Prime Minister Rami Hamdallah described the massacre as "a senseless act of terror and hate." "Palestinians stand with the American people in this difficult time," he said. Israeli Prime Minister Benjamin Netanyahu reaffirmed his support of the United States. Israel, he said, stands "shoulder to shoulder'' with the United States. Chinese President Xi Jinping telephoned Obama, Xinhua news agency reported, and expressed his "deepest sympathies, sincere condolences and deep grief for the victims." Japanese Prime Minister Shinzo Abe condemned the attack. He told reporters, "Japan stands together with the people of the United States" and "this despicable act of terror cannot be tolerated." Australian Prime Minister Malcolm Turnbull said the shooting was "an attack on all of us — on all our freedoms, the freedom to gather together, to celebrate, to share time with friends." Prime Minister Najib Razak of Muslim-majority Malaysia said he was "horrified" by the Orlando shooting. "Islam abhors killing of innocent people," he tweeted. “Our heart is with our American brothers,” tweeted Italian Prime Minister Matteo Renzi. Canadian Prime Minister Justin Trudeau tweeted, "We grieve with our friends in the US & stand in solidarity with the LGBTQ2 community after today's terror attack." Sadiq Khan, the mayor of London said, "I stand with the city of Orlando against hate and bigotry. My thoughts are with all the victims of this horrific attack." Ahmad Fawad Lami contributed to this report.